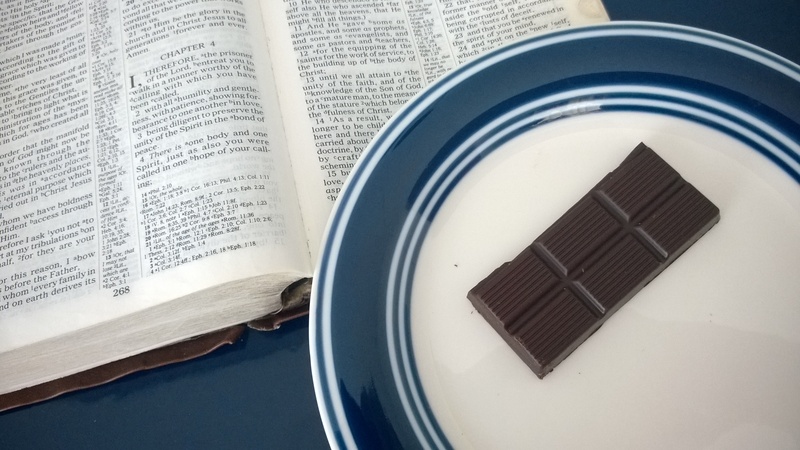 I’d like to begin today’s post with a few words about today’s chocolate. Madécasse is one of my favorite chocolate brands, not just for its flavor, but for its commitment to ethical, environmentally responsible, humanely produced chocolate at every step of the process. Rather than exporting beans to external processing plants, they aim to produce as much of their chocolate as possible in Madagascar, directly benefiting the communities that make their chocolate possible. It’s pricey, though, and I’m a selfish little slave to convenience who balks at going out of his way for any chocolate that I can’t walk to the local Kroger for, so I rarely have it. But my mom generously donated two bars of the darkest Madécasse she could find! Thanks, Mom. This bar is so aggressively dark that I could not concentrate on the text while eating it. But to get to the text: in today’s chapter, Paul returns to the metaphor of the body that he hinted at in yesterday’s passage (3:6) and developed more fully in 1 Corinthians 12, as we’ve seen. He underscores the importance of growth within the body, and encourages his readers to higher standards of behavior as an expression of how they’ve come to know Christ. Paul ties spiritual gifts and callings directly into the body metaphor. He lists a pile of gifts and callings–pastoring, prophesying, teaching, and more–and explains their purpose: “equipping…the saints for the work of service, to the building up of the body of Christ; until we all attain to the unity of the faith, and of the knowledge of the Son of God, to a mature man, to the measure of the stature which belongs to the fullness of Christ” (12-13). That’s a monster of a purpose statement, but the point is that Christian growth is not individualistic. It’s not just so we can feel good about being a good person. We grow so that we can better serve our brothers and sisters in the faith. As the arm grows in reach and coordination, it becomes better equipped to serve the body that it’s attached to, grabbing food and tools and such, using them to accomplish the body’s goals as dictated by the head, Jesus Christ. The eye, as it grows, learns to focus and notice and convey that information more quickly and meaningfully to the relevant body parts, so that they can better respond to threats and opportunities. Legs get longer, improve at running, learn their role in new skills like climbing and soccer, and suddenly the body can go to new places and do new things. We die to self; we get bodied for the body. And we all–whether we’re legs in the body or not–have to leave behind the way we used to walk before we came to know Christ. Paul contrasts his Christian readers with those who don’t know Christ: those who are “excluded from the life of God because of the ignorance that is in them” (18). These are the dead men walking that Paul talked about in the second chapter, who haven’t yet received a resurrected life from God. And he elaborates: “They, having become callous, have given themselves over to sensuality for the practice of every kind of impurity with greediness” (19). Each of those words give Paul’s believing audience a picture of the dead behaviors they’re supposed to leave behind. First, there’s callousness: numbness, insensitivity to God’s voice, being past the point of sensing, feeling, or caring. Next, there’s sensuality: rampant lust and unrestrained pursuit of bodily pleasures. Every kind of impurity? That covers a broad spectrum of vices, but whatever they might be, they all have one thing in common: uncleanness. They contaminate your walk, make it impure, like water that hasn’t got the lead and mercury filtered out of it. You can pollute your life with lying, rage, theft, and all sorts of behavioral garbage that neither I nor Paul have time to list right at this moment (but scroll on back to Galatians 5:19-21 if you want some more examples in that vein). And finally, greed: rampant desire for money. Anyway, the point is to not be self-serving in your growth goals. Develop your skills, talents, and gifts to serve the rest of the body and help them grow. That’s a wrap for today: mic drop, see you crew tomorrow. Posted in All the Paul, Daily Reading, Ephesians, New Testament, Topical Studies.Tagged bible, christianity, devotional, Ephesians, paul. I just want your readers to know ….when I asked what kind of bar to buy, you said you thought Madecasse made a bar that was 98-99% cacao. Really?!? If any reader knows of a bar that dark, would you let Jackson know. I’m rolling my eyes over 98-99%. It is entirely possible that I misspoke, but I have never believed that Madecasse makes any bar over 93% cacao.